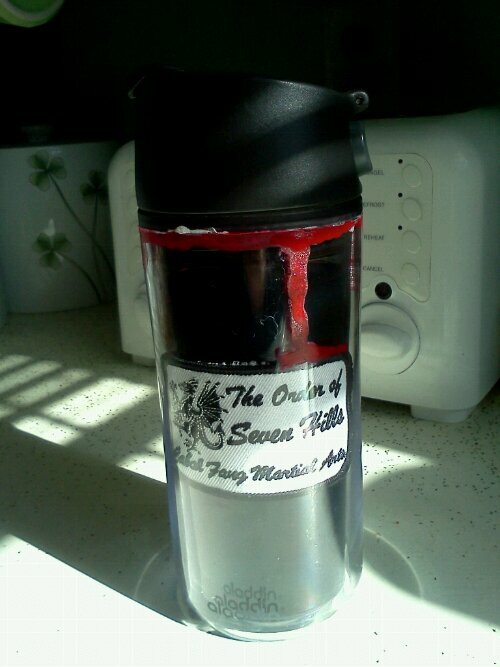 My Custom Insulated Mug, Sort of | Robert Mitchell Jr. I made some mods to my cup. Cool, right? I dropped my insulated mug and it broke. It’s one of those with the inner liner, and it broke right along the top. What a pisser — this is not just any mug, it’s the expensive Aladdin one that is completely spill-proof, the one I use to smuggle coffee into theaters that don’t serve it. Not the mug’s fault. I dropped it on asphalt on a cold day. I was about to throw it away when I realized that I might be able to fix it. People should fix more stuff instead of chucking it into landfills. I checked, and as it happens, Gorilla Glue is stable and food safe once fully cured. My other favorite glue, JB Weld, is not food safe (I once fixed an engine block with JB Weld — I’m not kidding — it held for two weeks until I could get it fixed properly). So I got out the Gorilla Glue and set to work. First I glued one of my martial arts club’s patches to the inner liner and let it dry. I figured, why not? Works for Tervis, right? Then I and reassembled it. The glue dripped a little (why didn’t I turn the thing upside down to dry? ), so I disguised the drips with blood red nail polish borrowed from my wife so that the drips would look like blood. Why blood? I don’t know, geez, it’s art. Gimme a break. This entry was posted in Green, Martial arts and tagged gorilla glue, mug, repair. Bookmark the permalink. Pingback: Keep Cup | Robert Mitchell Jr.